My inspiration for this editorial was the beauty of Puglia. From the beautiful coastline, to the azure waters and the rollings fields of ancient olive trees, the regions allure precedes it. 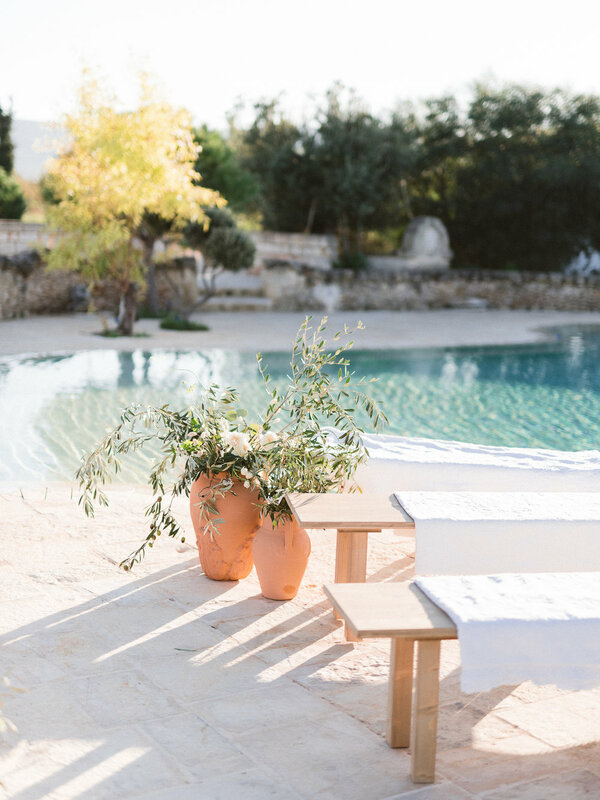 The Masserina Montenapoleone was the perfect embodiment of Pugia; with a stunning crystal blue pool lined in local stone, acres of olives orchards and natural vegetation. The history of the location as also important to me when designing; from its days as a Roman province, to the time when it too was underwater. Ancient fossils still grace the stones throughout the Massseria, and the effect is truly humbling. My aim was to be able to tell the story of this history and location through texture, color and design. I chose a color palette of creme, taupe, olive, terra cotta, azure and gold to symbolize the cliffs, the sea, the farm and the history of the region. The invitations were the result of a beautiful conversation between me and Shhh my Darling, whose interpretation of the there was truly magnificent. Paying homage to the history of the region, we chose a bust motif that emulated ancient Roman coins. A bing emboss on the invitation juxtaposed with a beautiful gold foil on marbled paper added the perfect amount of elegance to the otherwise natural look. I styled the suite with wheat grown on property and a shell, another homage to the history of farming and aquatic importance in Puglia. I set the ceremony on the backdrop of the beautiful pool, almost as if it were a ceremony on the sand, looking towards the sea. Beautiful benches from Che scena were draped in cotton throws from the Masseria. The talented Angelica created beautiful overflowing arrangements in terra cotta urns which we placed on either side the aisle. 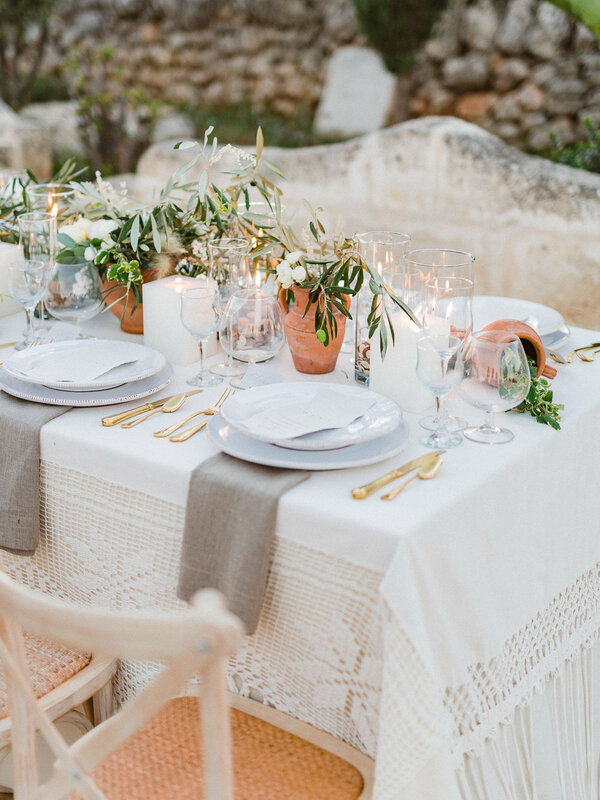 For the table I aimed to bring the beauty of the masseria to life. The Masseria is a working farm that produces organic food year round - to pay homage to that, I placed the candles in hurricanes lined in almonds and other nuts grown onsite. Acqua di Para candles in creme sat between organic arrangements created by Flower Addicted Angelica. I chose some beautiful terra-cotta urns from her collection to place on their sides with greenery flowing out from them - another homage to the proximity of the sea. The masseria has beautiful handwoven hammocks throughout the property and their texture made the perfect addition to the table as an overlay! The cake was a beautiful representation of history and ceramics. 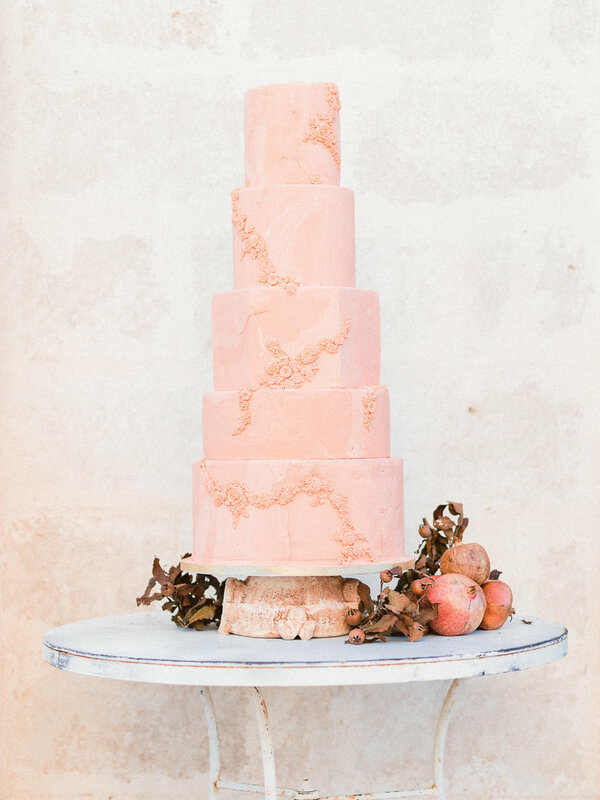 The gorgeous terra cotta tiers were detailed to look aged and sun worn. We chose a stone cake base and adorned it with pomegranates and dried leaves from the farms previous harvest. 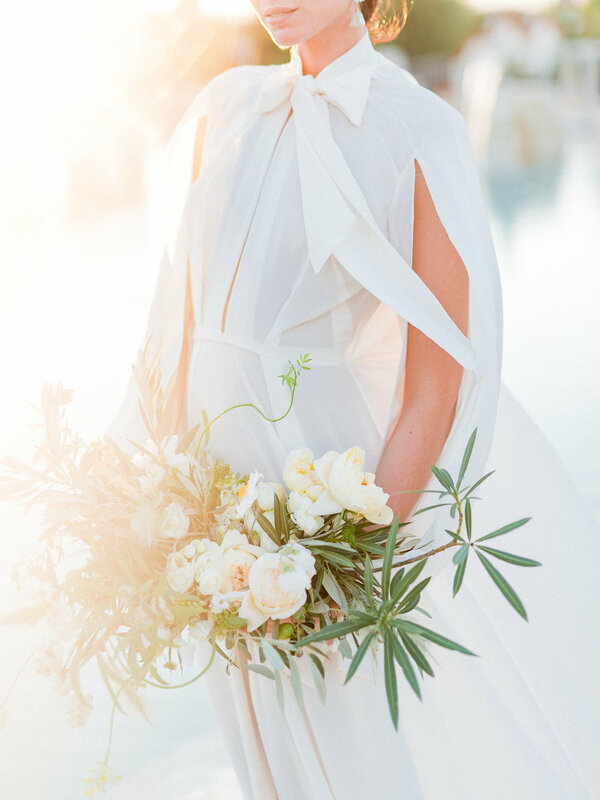 Our bride embodied elements of all the colors, textures and facets of the editorial. Her gorgeous gown custom made by Paolo Corona had an oversized train that moved in the wind like the water on the sea. Her earrings were an homage to the Roman history, with a pearl in the middle of a simple handmade gold design. Her bouquet was made of local olive, roses and other foliage native to Puglia. Her makeup was natural with a slight bronze, like a true daughter of Puglia who had spent much time kissed by the Italian sun.